I haven’t given myself a raise in 3 years. I deserve more… I have a degree. Raise your hand if you agree with one of the above statements. Raise your hand if you agree with all of the above statements. Raise your hand if raising your piano lesson rates based on one, or all, of these statements is a good idea. Is my hand the only one that isn’t raised? Are you shocked? 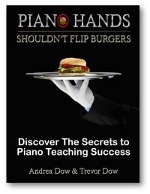 My hand isn’t raised because I don’t want to lead piano teachers astray in their pursuit of higher wages. Do I think piano teachers are worth more than their current salaries? Absolutely! But that doesn’t mean that they should raise lesson rates because of statements that begin with “I haven’t”, “I deserve”, or “I need”. 2. You will charge more than what the consumer is willing to pay, you will not attract any piano students, and you will still struggle to make ends meet. The key to financial success in piano teaching is to find that sweet spot where your perceived value is equal to your consumer’s perceived value. If your consumer’s perceived value is greater than your own perceived value, you’ve got it made… raise your rates and reap the rewards. If your consumer’s perceived value is less than your perceived value… well, this is the interesting part… isn’t it? My bet is that as you read that you were assuming I would say, “lower your rates to match expectations”. But, that’s not the case! So, what do you do if your consumer’s perceived value for piano lessons is less than your perceived value? Well, you could lower your rates, but who wants to do that? Not me! Raise your consumer’s perceived value by explicitly showing them what you are really worth! This is an area that piano teachers, and the industry as a whole, need to work on. And who can blame teachers for letting this slide… after all, piano teachers are teachers not marketers! But if fair wages are what piano teachers are after, then a little bragging to the public (so to speak) may be in order. 6. With permission, share student performances on Facebook, Youtube, etc. 9. Make your own piano parents VERY aware of all the benefits their children reap due to their involvement piano lessons. There is lots of supporting research out there. Find it and use it!